Picture used as Creative Commons. With assignments, studying, tests and extracurricular activities, students sometimes feel as though they are carrying the weight of the world on their shoulders during the school year. And for some students, they literally do. Factoring in lunch, daily supplies, binders and textbooks, the weight students are carrying around in their backpacks is potentially harmful. The American Academy of Orthopedic Surgeons recommends that the weight of a student’s backpack should be less than 10 to 15 percent of the student’s body weight. Textbooks can weigh up to 5 pounds. 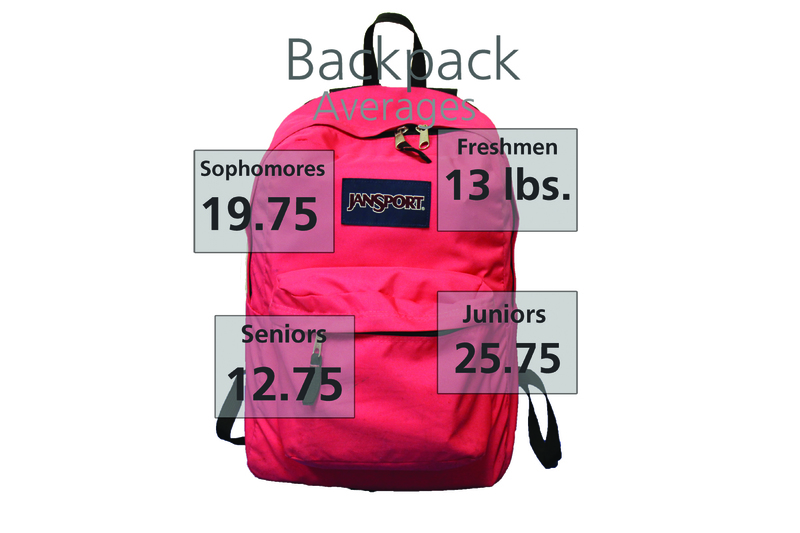 This excessive weight that students carry each day can quickly add up to a dangerous amount. The federal Consumer Product Safety Commission calculated that carrying a 12-pound backpack to and from school and lifting it 10 times a day for an entire school year put a cumulative load on students’ bodies of 21,600 pounds. This is equivalent to lifting six mid-sized cars. Doctors agree that overloaded backpacks can negatively impact a student’s posture. According to Dr. Elise G. Hewitt, the president of the American Chiropractic Association’s Pediatric Council, from an interview with the Huffington Post, the shoulders were not designed to hang things on. By carrying heavy loads daily, students could end up with rounded shoulders and lower back injuries that could impact their lives after high school. This position that students take to balance the weight on their back can compress the spine and cause vertebral disks to be pressed. Also, when students have to raise their neck to see in front of them, pinched nerves and neck pain can result. Shoulder straps can present a significant problem when excessive weight relies on them. The straps can apply pressure to blood vessels and nerves in a student’s neck. This pressure can cause pain and tingling sensations in arms, hands, legs and necks, Brown said. The use of only one shoulder to carry an overloaded backpack, resulting in a student putting more weight on one side than the other, can cause a student’s spine to curve unnaturally. To avoid this curvature, it is advised that students use both straps when carrying backpacks. Administrators with the Henderson County Public Schools have requested funds to purchase Chromebooks for area high school students next year. The computers would help reduce the weight students carry on their shoulders by reducing the number of textbooks being issued. The 3-pound laptops would create a significant contrast to the load of multiple textbooks that are required for different courses. Technology is in all aspects of students’ lives and this will be a way to incorporate their interest in the classroom, according to Kim Berry, school nurse. Until the Chromebooks become a reality, students have to manage the weight they carry on their backs. This problem has become so widespread that the California State Assembly passed legislation that would force school districts to develop ways of reducing the weight of students’ backpacks. New Jersey is considering similar legislation. Doctor’s offices are advising students to wisely consider what they carry on their backs on a regular basis. They encourage students to take out things they do not need and suggest carrying books in front of them instead of on their shoulders. “I carry my textbooks outside of my backpacks because my backpack is so full of binders and other books for all of my classes,” junior Elizabeth O’Donnell said.